The International Confederation of Midwives (ICM) defined three pillars through which to strengthen midwifery worldwide. The present paper aims to describe how these three pillars—education, regulation and association—have progressed in Brazil. Following a brief overview of midwifery in Brazil and of the background behind the creation of the midwifery program at the University of São Paulo, Brazil, the characteristics of midwifery training are described in detail, as well as the peculiarities of the regulations governing the profession of midwifery and the relevance of social movements and associations in the process of the inclusion of midwives into the labour market, in achieving social visibility and fostering consolidation of the profession in the country. Next, the reports of two midwives regarding their first years of work in different settings are presented as a means of characterizing maternal and perinatal healthcare in Brazil. In conclusion, midwifery training has a visionary nature that seeks to transform the current obstetric care model in Brazilian society both quantitatively and qualitatively. 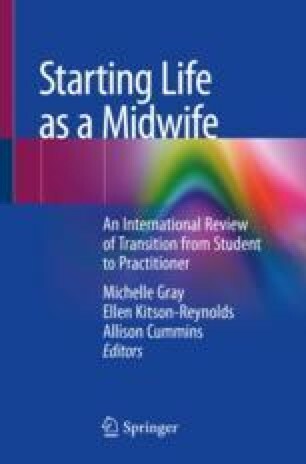 The authors gratefully acknowledge the invaluable testimonial contributions of the midwives Raphael Marques de Almeida Rosa da Cruz, e-mail: raphaelcruz@hotmail.com, and Thalita Vital Botelho, e-mail: tatavital@hotmail.com. Brazil. Law # 7498 of June 25, 1986 regulates the nursing profession and provides other measures. Brasília; 1986. http://www2.camara.leg.br/legin/fed/lei/1980-1987/lei-7498-25-junho-1986-368005-norma-pl.html (Document in Portuguese). Accessed 15 June 2017. Brazil. Decree Law # 94.406 of June 8, 1987 regulates Law # 7498 of June 25, 1986, which regulates the nursing profession and provides other measures. Brasília; 1987. http://www2.camara.leg.br/legin/fed/decret/1980-1987/decreto-94406-8-junho-1987-444430-norma-pe.html (Document in Portuguese). Accessed 21 July 2017. Brazil. Ministry of Health’s Publication # 371 of May 7, 2014 establishes guidelines for the organization of comprehensive and humanized care for newborn infants under the Unified National Health System (SUS). Brasília: Ministry of Health; 2014. http://bvsms.saude.gov.br/bvs/saudelegis/sas/2014/prt0371_07_05_2014.html (Document in Portuguese). Accessed 10 June 2017. Brazil. Ministry of Health’s Publication # 11 of January 7, 2015 redefines the guidelines for the implantation and regulation of a normal childbirth centre within the scope of the Unified National Health System (SUS), for the care of the woman and her newborn infant at the time of delivery and of birth, in accordance with the childbirth component of the Stork Network, providing the respective financial incentives for investment, costing and monthly costing. Brasília: Ministry of Health; 2015. http://bvsms.saude.gov.br/bvs/saudelegis/gm/2015/prt0011_07_01_2015.html (Document in Portuguese). Accessed 10 June 2017. Girardi SN, Fernandes JH, Carvalho CL. The regulation of health-related professions in Brazil [A regulamentação das profissões de saúde no Brasil]. Revista Espaço para a Saúde. 2000; 2(1). http://www.ccs.uel.br/espacoparasaude/v2n1/download_artigos1.htm (In Portuguese). Accessed 20 May 2017. Leal MC, Gama SGN. Born in Brazil. National survey on childbirth and birth - executive summary of the research [Nascer no Brasil. Inquérito Nacional sobre Parto e Nascimento - Sumário Executivo Temático da Pesquisa]. ENSP/FIOCRZ; 2012. http://www.ensp.fiocruz.br/portal-ensp/informe/site/arquivos/anexos/nascerweb.pdf (In Portuguese). Accessed 10 June 2017. World Health Organization. Safe motherhood needs assessment. Geneva: WHO; 2001. http://www.who.int/reproductivehealth/MNBH/smna_index.en.htmlS. Accessed 25 May 2017.